Ninety-five. That is how many people lost their lives in motorcycle crashes in Louisiana in 2017. Here it is May 2018 and some experts are predicting that number will rise even higher this year. The year isn’t even half over and already so many of my fellow riders have been lost to impaired and inattentive drivers that I cannot accurately tell you how many have died. There is an official count, and I guess I could check it and report it to you, but right now I can tell you that it is too many. I have been riding motorcycles since I was 13 years old. Over the years, I have lost many friends and acquaintances on the roadway. I know riding a motorcycle is dangerous. Many things that we do for fun and pleasure have risks associated with them. In choosing to ride I accept those risks. But what I do not accept is how some motorists behave when they get behind the wheel of a car or truck and get out on the highway. Some drivers present risks that none of us should have to endure. I see it on the road nearly every time I ride. First there are the distracted drivers. Drivers who are texting or carrying on animated conversations on their cell phones; people putting on makeup, eating, or steering with their knees; parents disciplining their children in the back seat. I have even seen people reading books and magazines while attempting to drive. Next are the aggressive drivers, constantly changing lanes, tailgating, bullying and driving way too fast. Finally, there are the criminal drivers who think there is nothing wrong with downing a six pack and jumping behind the wheel or self-medicating with pills or pot and attempting to make their way home after a night out on the town. The truth is, you cannot see what you are not looking for and you especially cannot be looking for anything very well if you are not paying attention, or worse yet, are under the influence of drugs or alcohol. May is Motorcycle Awareness Month. A time when we encourage drivers to be on the lookout for motorcycles. But really, every day of the year everyone behind the wheel should be on the alert for motorcycles. Recently a friend told me of a game she and her husband play with their children when they are out riding. She says to keep the kids occupied she asks them to count motorcycles. I remember doing the same thing with cows on family trips when I was a little girl. Counting motorcycles however has an added benefit, it teaches young people to be looking for them when they are on the highway. Remember, you cannot see what you aren’t looking for. I first met Jean Lemay nearly six years ago. At the time the Royal Canadian Mounted Police Officer had shipped his Harley from his home outside Montreal to New Orleans. He was touring Louisiana before riding it all the way back home on a three-week journey which included 11 states. Jean had contacted me on Facebook and asked for some riding recommendations but I did him one better and took him on one of our favorite rides up LA Highway 22 to Madisonville, Louisiana for lunch at Friends on the Tchefuncte River. Apparently, Jean enjoyed the ride and the good food. He promised that when he retired from his job as a Mountie he would be coming back to Louisiana. A few weeks ago, Jean made good on that promise and this time he brought along his wife Jocelyne whom he calls Jo Jo. Last year Jean and Jo Jo retired from their jobs in Quebec, sold their house, cars and most of their belongings. They then bought a 41-foot motor-home they nicknamed “Monster” and a trailer to haul their Harleys behind it. In October, they headed south. Now Lemay is picking up where he left off six years ago, and showing Jo Jo many of the sites he saw on his previous trip down south. We met up with Jean and Jo Jo in Baton Rouge a few weeks ago for another ride and lunch. This time we headed north to the Felicianas. Our ride took us through the countryside outside Jackson, Louisiana and up highway 421, which makes a nice 20-mile loop through the region. The highway is a favorite of backwoods riders, motorized or not. It is lightly travelled and provides a great scenic view, just perfect for our Canadian friends to sample the south Louisiana countryside. At US 61 we turned south and headed back toward Saint Francisville, for lunch at one of my favorite places in the area. The Francis Southern Table and Bar has only been open a few years, but already it is one of the most popular places to eat in the region. Jean and Jo Jo both ordered shrimp poboys and were delighted to find a poboy is not just another sandwich. After chowing down on poboys and salad we took a tour of Grace Episcopal Church, where we talked about the history of the region and I showed them the grave of Captain John Hart. During the Civil War, Federal and Confederate forces stopped fighting long enough to give Hart a Masonic burial. Masons from both sides participated. After the funeral the fighting resumed. It is known as the day the war stopped. 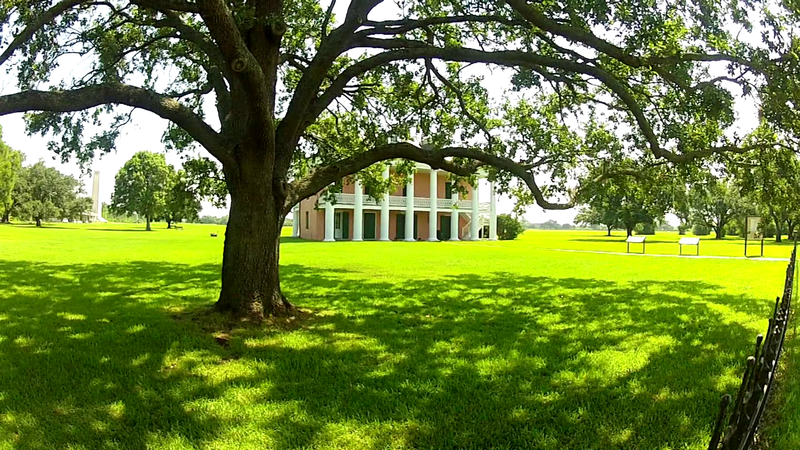 We then headed over to Rosedown Plantation for a walk through the gardens and a view of the old home. Following their Baton Rouge visit Jean and Jo Jo headed to New Orleans to take in as many Mardi Gras parades as possible. Once they get their fill of beads and doubloons they are off to Daytona Beach, Florida for Bike Week. After that they will turn Monster north for the long journey home. But they plan to head south again as soon as the weather in Quebec starts turning cold again. “Laissez le bon temps rouler,” Jean and Jo Jo Lemay. Two French Canadians who not only know what that phrase means but are also living it each day. I have travelled a lot of miles on two wheels and I have been to a lot of places … but there are two things I never pass up … a trip to Nashville and a ride on the Natchez Trace. 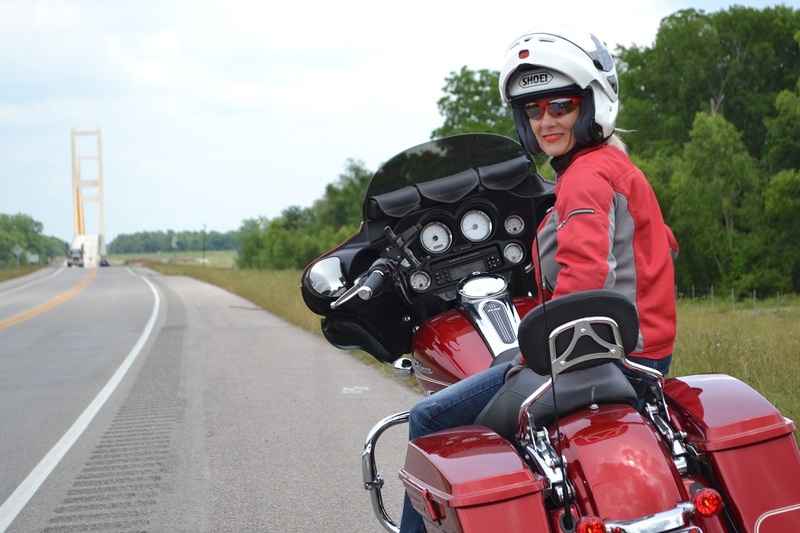 First, I am a big country music fan … second there are few roads better suited for motorcycle riding than the Trace and when I can combine the two, it is a no-brainer – I’m in! When Tammi Arender called, and said she was covering a big music city awards ceremony that featured Garth Brooks, Ricky Skaggs and Eagle’s guitarist and writer Don Felder, I was packed and heading up the Trace on Red Rider before I could hit “end call” on my cellphone…. The Birdsong Hollow Bridge It is the perfect place to stop and reflect on just how wonderful the trace is and how great it is that it has been preserved and protected…. Upon arriving in Music City Tammi and I immediately hit the streets of downtown Nashville. I already had a fancy dress for the big awards ceremony at the Musicians’ Hall of Fame, but I needed some fancy boots to complete my wardrobe. Nothing like shopping for boots in downtown Nashville, especially in all the shops up and down Broadway. It didn’t take long to find the perfect Pair at French’s Shoes and Boots just one block off Broadway on Second Avenue. In fact, Tammi and I had enough time left over for a tour of the Ryman Auditorium, the old church that served as the home of the Grand Old Opry from 1943 to 1974. There is a lot of history in this old building. We even had enough time for a quick “coke” at the Famous Tootsie’s Orchid Lounge. I just love looking at all the old pictures on the wall and listening to all the future Nashville stars who perform there. Back at the hotel we quickly changed into our fancy dresses. Yes those are lipstick kisses all over my dress, just like the ones on the lipstick bike, and of course my new boots are red. What else, right? At the Awards ceremony, I felt like a star when Tammi and I walked the red carpet. Actually, we got to walk it several times since we were filming a segment for LA Rider. Inside I got to meet all the stars and watch Tammi interview Garth and Ricky and Don. What an incredible evening. Later we enjoyed a meal on the rooftop of one of the restaurants on Broadway and watched the sunset. I had only been in Music City for less than a day and I quickly understood why Tammi has made it her second home. Nashville is a beautiful city, filled with an abundance of wonderful, interesting and talented people and most of them are just like you and me. Except they can sing and play instruments. The only place I sing is in the shower, and its soundproofed! There is a hamburger joint on every corner but when you want a hotdog you have to go searching. I am not sure why that is true. After all, the hotdog is listed right up there with apple pie as one of America’s favorite foods. Now I don’t eat hotdogs all the time, but every once in a while I get a real craving for an old-fashioned Coney or a Chicago Dog and when that happens I really don’t have a lot of choices; make them myself or go to Sonic. Now everyone knows I don’t cook and while there is nothing wrong with Sonic, their dogs really lack bite or bark. Recently however I found an incredible place that serves up some pretty incredible dogs not far from where I live right here in Baton Rouge, Louisiana. What’s more, these aren’t just your “garden-variety” hotdogs. These are gourmet dogs with a south Louisiana kick. The place is called Frankie’s Dawg House. It has been around for a few years, but recently came under new ownership and the new owner has added a number of Cajun and south Louisiana specialties to the menu including alligator and deer sausage. Bob Courtney and I checked them out a couple of Saturdays ago and we were both completely blown away. Check out my report and pay them a visit. I don’t think you will be disappointed. Bikers love road food and when it comes to hotdogs Frankie’s Dawg House is definitely Top Dawg! It is only a short ride for me and believe me I will be making it again. Real Soon! I might even bring my dogs, well in the truck, not on the Harley. By the way you couldn’t meet a nicer bunch of people either and no, I didn’t eat four hotdogs. Bob ate part of one. This Saturday morning I woke up with an incredible craving. I must have been dreaming about food. Well, I do dream about food sometimes. Anyway I wanted pie. Yes pie. You know, fresh baked, homemade pie. Now since I don’t cook that meant I had to go and get myself some pie and since the weather forecast called for highs in the 70’s and no chance of rain that meant taking a spin on Red Ryder, my 2013 Street Glide. “Ride to eat – eat to ride” — that is my motto you know. Within a few moments I was on the bike and headed north. Now there are several really good places to get top-notch homemade pie around here and one of my favorites is Mammy’s Cupboard just outside Natchez, Mississippi. Mammy’s is one of those quirky, roadside attractions you find off the beaten path. Built around 1940, the building is basically a big, uh, southern mammy, as in Gone With the Wind Mammy. Actually the place wouldn’t be very politically correct these days, except over the years, with every new coat of paint, Mammy’s complexion has gotten a lot lighter. Mammy’s has been a lot of things since 1940 and today she hides an incredible roadside cafe underneath her skirt. If you like good southern style home cooking with menu items like chicken pot pie, red beans and rice, roasted chicken and vegetable soup this place fits the bill. But the deserts are what I come for. If you want lemon pie with five inches of creamy meringue piled on top or banana and caramel pie topped with crunchy toffee this is a must-stop kind of place. Now if it weren’t for the fact that Mammy’s is more than 100 miles from my driveway I would come here at least once a week. I would also have to install heavy duty shocks on Red Ryder and the Lipstick Bike. Thank goodness I don’t normally dream about pie. But when I do I head straight to Mammy’s Cupboard on U.S. 61, just south of Natchez. It makes for a great motorcycle ride and more than that, like me, it is just a little bit quirky. I love living and riding in South Louisiana. Oh, I know we don’t have beautiful mountain vistas. After all, Driskill Mountain, the state’s highest point is only 535 feet above sea level and covered with trees. But some of the roads and highways that hug our rivers and bayous are just as twisty as many mountain byways. The fact is, Louisiana is filled with incredible beauty from the swamps and bayous in the south to the rolling hills and hardwood forests in the northern part of the state. I have been riding this state from one corner to the other for nearly fifteen years and I have yet to see it all. As some of you know, I like to use Susan Sontag’s great quote, “I haven’t been everywhere, but it is on my list,” to describe my quest to see as much of this state as I can. Perhaps the greatest thing about living and riding in Louisiana is that I can do it every month of the year. Many of you who live elsewhere have to store your bikes for the winter. Not here in the Bayou State. Now we do get rain, and if you are a fair weather rider you might want to sit out the occasional thunderstorms. Of course we also are occasionally visited by tropical storms and hurricanes and during those times we pretty much have other things on our mind. Now I don’t normally ride when the temperature dips below fifty, but when that does happen it is usually only for a few days in a row and then it is warm again. This weekend high temperatures reached into the upper sixties and I donned my leathers, put on the heated grips (my hands get cold in the summer sometimes) and headed out on the highway. I like riding when there is no particular place to go. I have written about it before. I call it helmet time — just me, the bike and the highway stretching out before me. Usually I just pick a general direction like north, south, east or west. Sometimes, I choose a particular highway or road. Each time it is different. Saturday I chose to ride west. My route took me primarily along Louisiana highways 16 and 22 through Livingston Parish into Tangipahoa and back again. Since there was a chill in the air I decided I would take a lunch break for a little hot gumbo. One of the great things about riding in Louisiana, especially along Highway 16 and 22 is there are dozens of great places to pull off and enjoy a locally cooked meal featuring fresh caught Louisiana seafood. I found great gumbo and shrimp salad at Charlie’s Steak and Seafood House in Springfield, Louisiana.Charlie’s is one of my favorites and I have enjoyed many meals there. In all I racked up about 200 miles and enjoyed a wonderful meal – making for another great riding day in Louisiana, thanks to our year-round riding season. I even made it home in time to put Red Ryder away and take the Lip Stick Bike for a spin around the neighborhood. I hate to admit it, but that old Johnny Horton song was about the sum of my knowledge concerning the battle of New Orleans until a recent ride to Chalmette, Louisiana. That ride took me to the National Park which today commemorates that pivotal event in American history officially known as the Battle of New Orleans. 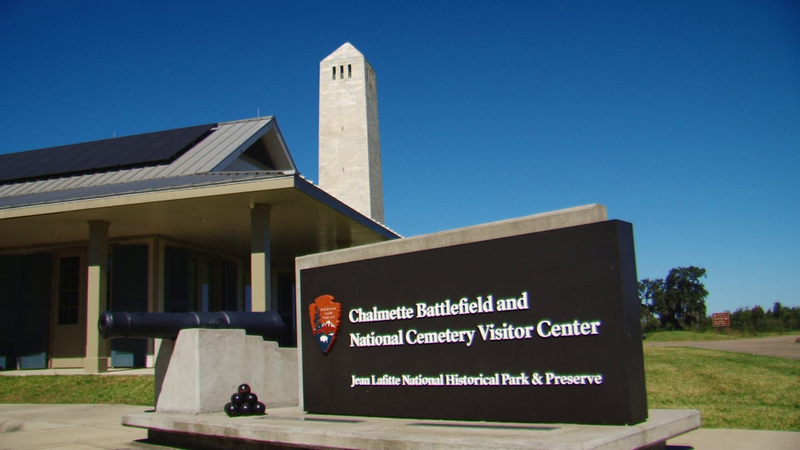 The address of the Chalmette Battlefield is 8606 West St. Bernard Highway, Chalmette Louisiana, so the Battle OF New Orleans was actually the Battle FOR New Orleans, since it took place in St. Bernard Parish, just down-river from the famous city. What history refers to as the Battle of New Orleans was actually a series of skirmishes that began before Christmas in 1814 with the final deciding battle taking place on January 8, 1815. By the way, the Johnny Horton song apparently demoted Andrew Jackson a couple of ranks since he was actually a Major General not a Colonel at the time. Today the Battlefield is a beautiful green space in what is mostly a densely industrialized area. The first thing you will notice as you enter the gate is a one hundred foot obelisk which looks very much like the Washington Monument. 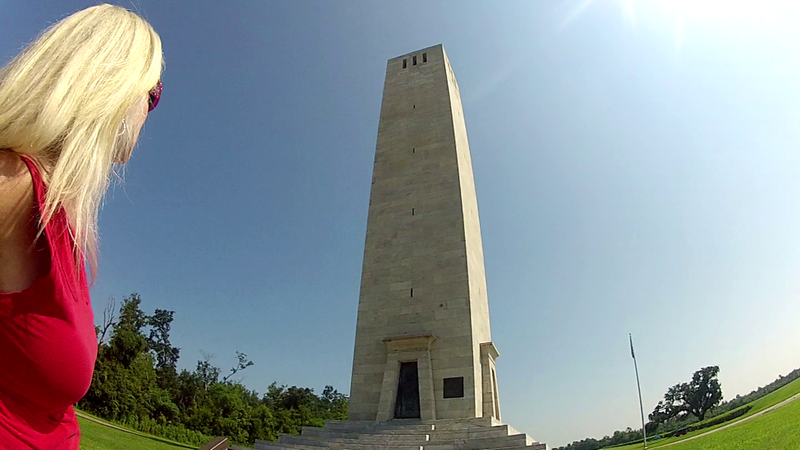 Built to honor those who fought and died in the battle of New Orleans, the monument was actually proposed in 1852 but not completed until 1908. The battlefield area is lined on one side with re-enforced earthworks and cannon representative of those used by Jackson’s troops in defense of the city. 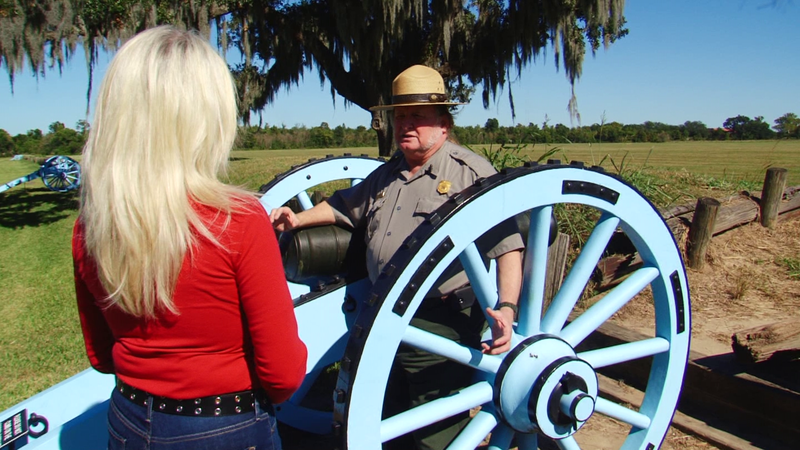 The visitor’s center includes an interpretive exhibit on the battle as well as artifacts and other objects and art from the period. It is a great place to learn all about the War of 1812 and the significance of the events that took place here. Many people like to point out that the war was over when the battle of New Orleans was fought. Not true, according to Park Ranger Ron Merrell. While it is technically true the Treaty of Ghent had been signed on Christmas Eve 1814, it had not been ratified, so the war was far from over — In fact, fighting actually continued in Louisiana until the official British retreat on January 18, 1815. Merrell says the Battle of New Orleans was important for a number of reasons, because it helped establish the young United States as an important player in world affairs and it of course made Andrew Jackson a national hero ultimately carrying him to the White House. Speaking of houses, there is also a beautiful old home located on the Battlefield. 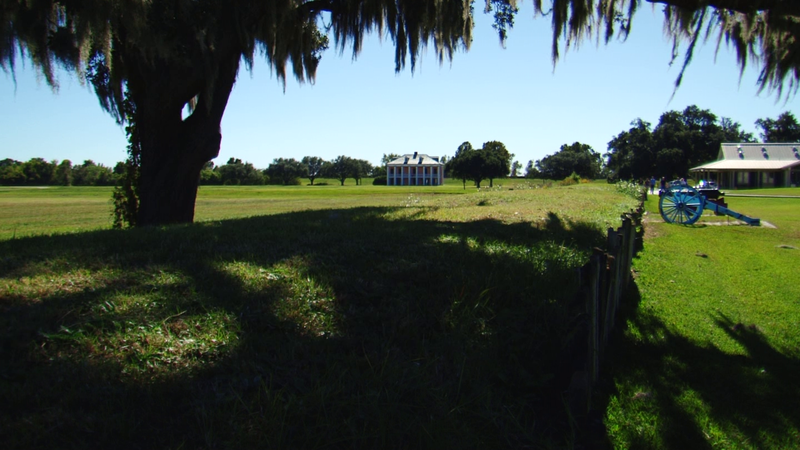 Known as the Beauregard House it was constructed on the property about 18 years following the battle. The National Park Service restored it in the 1950’s and portions of it are open for tours. Some people claim it is haunted, but I didn’t see anything unusual, of course it was mid-day when I visited. Early next year, there will be a series of events in the New Orleans area celebrating the bicentennial of the Battle of New Orleans. You know, a ride to New Orleans is a great ride anytime but if you are a history buff now would be the time to start planning a trip to the Crescent City. 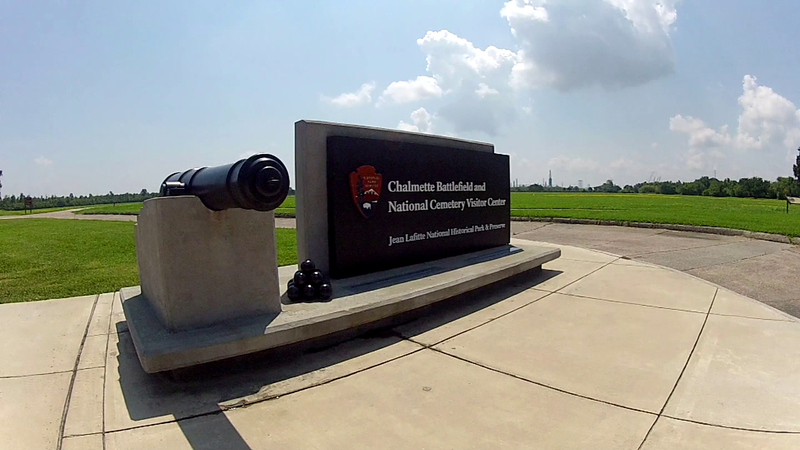 For more information on the Chalmette Battlefield and the upcoming Bicentennial here are a few links that might be helpful. Hope to see you in New Orleans in January. Until then, I’ll see you on the road. Oh and one other thing, I promised Ranger Merrell I would not use that Johnny Horton song, but he said it was okay as long as I pointed out this historical fact: The tune to the Horton song is actually taken from an old 19th century fiddle tune called “The Eighth of January” which was written of course to commemorate the Battle of New Orleans. Watch out, riding a motorcycle can be a very enlightening experience!